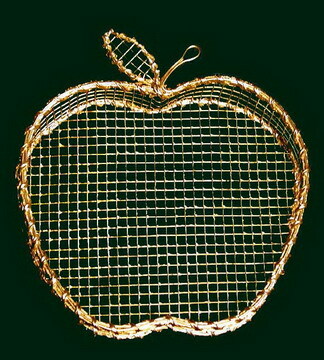 This Apple basket is made of wire mesh. It makes a great Judaica gift basket. It measures 7.25 x 6.5" x 1.5" high. This item is available in all Metallic Finishes. The sample shown is finished in Gold. This item is also available in two more depths. Please click on item K2017 to view the deeper basket, or item K2018s to view the shallower basket.